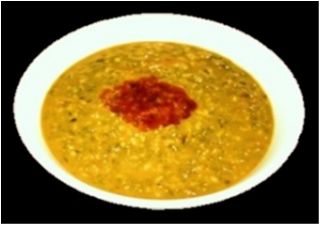 Sprouted Moong dal is healthy, nutritious and has an excellent fresh flavor. It can be eaten raw as a salad or as a snack. Process of sprouting the beans increases the nutrition value of the beans. They are high in protein and good source of dietary fiber. Sprouting beans are fun to sprout and lot easier than you think. 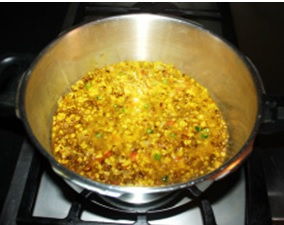 Sprouted moong dishes are healthy for people of all ages. 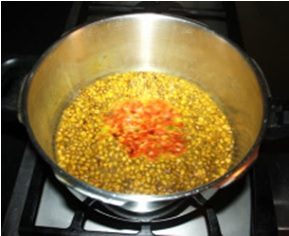 Lentils (dal) are an important part of our daily food and one can get tired of eating same style of cooking but if we make variation our food will taste much better. ​ until the water appears clear. 2. 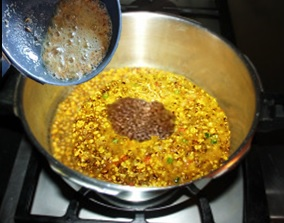 Transfer washed sprouted Moong into the Pressure cooker. 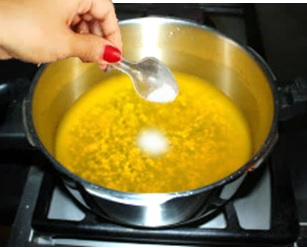 ​ pressure cooker and place the weight on the lid and cook on medium heat. 4. In about 8 to 10 minutes pressure cooker will start steaming turn the heat down and cook for 3 minutes. Turn the stove off and wait until steam goes down. Different brand of cooker require different time to cook. ​ you have the desired consistency. you start seeing the sprouts. 2. Use pressure cooker for cooking dal, otherwise it takes too long to cook dal. 4. It takes about 34 to 36 hour to sprout the beans. If you are going to cook on Saturday morning then on thursday night soak the beans, Friday morning drain the water out and cover with a damp towel. 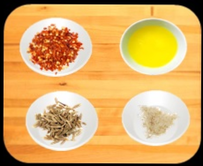 Friday evening you will start seeing little sprouts, and towel and beans becomes dry, wet the towel and rinse the beans and place them back. Saturday morning beans will be completely sprouted and ready to cook. 1. Heat small frying pan, add 2 tablespoons vegetable oil, sliced onions and minced garlic, and sauté them on medium high heat for 5 to 6 minutes or until onions become light brown, while frequently stirring them. 2. 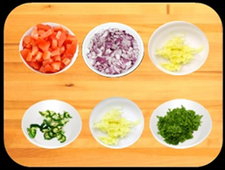 Add chopped tomatoes, grated or chopped ginger and chopped green chilies and cook. With the spatula try to mash the tomatoes so that they become soft quickly. In about 5 to 6 minutes tomatoes will become soft and blend with onions. Turn the stove off.